Gebuwin has a wealth of experience in the field of hoisting and pulling products. Our products and services are mainly used in the marine and offshore, chemical and agricultural industry as well as the industrial machinery and building sector. 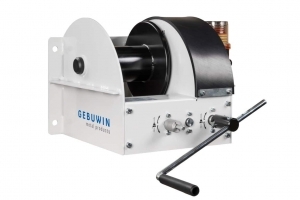 Gebuwin offers a wide range of hand- and electric operated winches for various applications. To ensure quality all of our product development is done in house in our engineering department. Gebuwin winches have a robust design, are highly reliable and always have a safety factor of 4. A custom made solution is a solution designed according to your specific needs and requirements. This will give you a product ready to use in your application and therefore you will save time and effort. Are you keen to know what Gebuwin can do for you? Take a look at our completed projects and contact us for any requests or questions. Besides our range of winches, we also offer three types of swivel davits and a variety of accessories for our winches like auxiliary motors, pulley blocks, wire rope cables etc. Along with the hoisting and pulling products we are a supplier of various stamping and turning subcontracting products as well as subassemblies or complete end products. Gebuwin was founded in 1947 by the two brothers Buunk in Winterswijk, the Netherlands and is since 1965 family owned. All products are designed, engineered, assembled and tested within the production facility of over 2000 square meter. With an enthusiastic team..
Welding is very important for products that move heavy loads, the winch must of course be able to uphold the load. After all, the welding work keeps the winch together.